Five musicians performed in the Zhovtnevy Palace for three evenings in succession. Representatives of the European company ECM Records, the Saluzzi brothers, opened the festival. Dino is one of the world’s best bandoneon players. Bandoneon is a type of concertina popular in Latin America. He has recorded nearly 10 CDs with the German label. Felix plays the saxophone. Together with the German cellist Anja Lechner, and Holland’s Metropole Orchestra, conducted by Jules Buckley, the musicians created a new album El Encuentro to music by Gustavo Pazos. In Ukraine they showed a program based on his works. Instead of the Amsterdam orchestra, the extensive compositions, with an emphasis on tango, were played by the Kyiv chamber band New Era Orchestra (conducted by Tetiana Kalynychenko). Then the renowned American band Yellowjackets appeared on stage, it has been working for 25 years in good old fusion style. Their performance contrasted strongly with the previous set, shadowing its lyricism, and confirming the popular opinion that all music genres are good, if only artists perform properly. The second soiree was launched by the American quartet Oregon. This band has been performing on stage for almost 40 years. It includes Paul McCandless (oboe, bass-clarinet, saxophones, and flutes), Glen Moore (contrabass and electric bass), Ralph Towner (guitar) and Mark Walker (drums). The performance of this band was dynamic, diversified, both in terms of timbre and genre — it was based on different kinds of ethno music, where not only American ballads, but also Irish jig and Indian tunes can be heard, Sometimes the air was filled with bird singing, the pur of streams, and pastoral playing of quills. The performance of Oregon was followed by the renowned Lee Ritenour from the US, who does away with the boundaries of music styles and streams. He was accompanied by his colleagues: the famous drummer and former member of Earth, Wind & Fire band Sonny Emory, the already known to Kyiv’s audience bass guitarist Melvin Davis and the keyboard player Patrice Rushen. The performance was pop jazz to the max. Whereas during the beginning of the set the Americans sought to look at least somewhat “academic,” they finished their performance in a less refined manner. Certainly, the high overall level of the participants still kept the performance within the framework of professionalism and good taste. 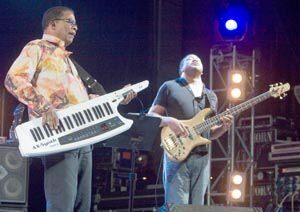 The closing ceremony of the festival featured Herbie Hancock, the 12-time winner of the Grammy Award, and his quintet. The audience roared with admiration, greeting the star. Hancock marked his 70th anniversary in April, but he easily jumped on the high pedestal to whisper something to the drummer, sitting above the stage. Hancock is a real showman, he’s very friendly and benevolent. Several times the musician addressed the audience, explaining the concept of the performance and joked. Hancock is a wonderful pianist, who is known to play nearly all kinds of synthesizers. In Kyiv he played a Steinway grand piano and two synthesizers, one stationary and one suspended on a belt. He mainly performed songs from his latest album The Imagine Project. The premiere of this collection presenting songs of the popular performers of the past, like The Beatles, Bob Dylan, Sam Cooke etc. took place this summer. The disc features invited stars. Anoushka Shankar and Seal did not come to Kyiv, but the audience who attended the concert, greatly enjoyed the music of the other musicians. And Hancock’s subtle skill of playing the piano, and his gift of improvisation, owing to which he captured the attention of the audience to his performance, is long the object of well-deserved fame. The musicians played for nearly three hours, and ended their performance with the legendary Chameleon.